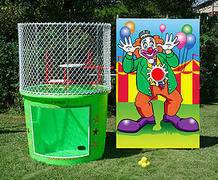 Customer must provide a water source and hose within reach of the setup area for the Dunk Tanks. Rental includes balls. Minimum height for participants must be over 5 ft tall and maximum weight of participant is 250 lbs. Keep Dunk Tank away from electrical sources and drain the tank of water when supervision is not present.